In this post, QSY teacher Jen shares about incorporating the principles of yin and yang into your practice. Check out her weekly Yin class to learn more, or sign up for her upcoming workshop on Sunday Sept 28 – “Wonderwall: The Ultimate Yoga Prop“. Philosophically, yin is comparative relativity; the idea that without dark there can be no light. We’ve all seen a yin yang symbol, at least in passing. Looking at this graphic representation, you can see a few things. One is that yang and yin are two pieces of a whole. One cannot exist without the other. 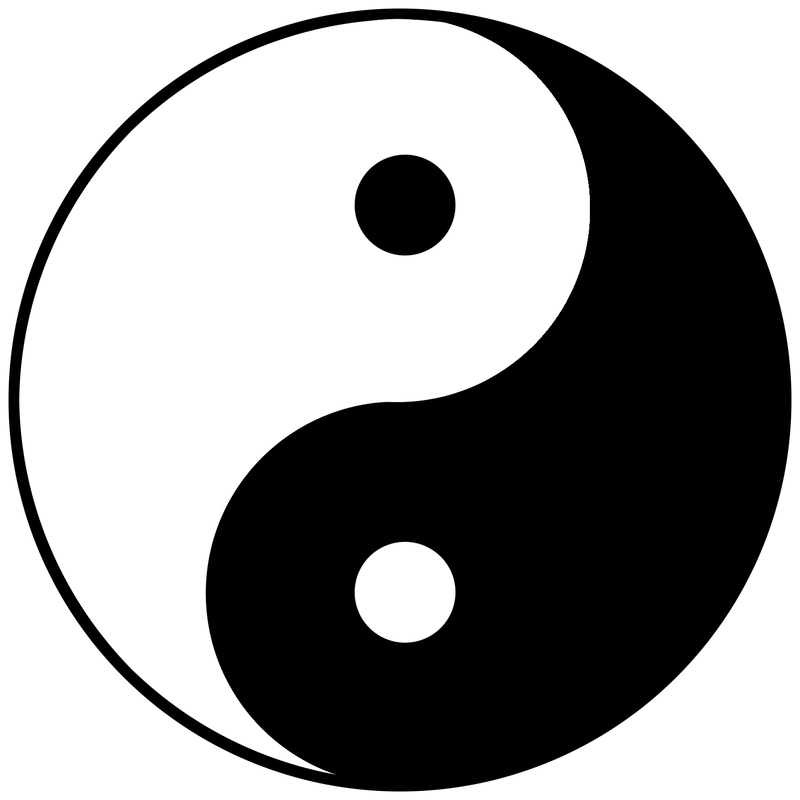 Another is that yang contains a piece of yin and vice versa. There is a contrast, and within that contrast you will also find relativity. Surrounded by black, the smaller white circle looks a little more gray. Surrounded by white, the smaller black circle looks a little more stark. How do Yin and Yang show up in yoga practice? In practice, when you add just a bit of yin to your yang practice it will most likely feel a little more active. Your muscles will be firing and may resist softening. In reverse, if you add just a bit of yang to your yin, it will feel even more starkly active. Finding the balance is your practice. This will be different for everyone. I have a pretty busy day to day in the summer, what with four kids at home. I also practice a different active sport, so I find my balance in slower yoga practice. In the winter when I am a little more sedentary, behind the computer a lot working on school work, I tend to gravitate a little more towards flow yoga. Finding balance incorporates your whole life. Consider yin as a spectrum of experience (maybe, consider everything that way). If your experience with water has been only hot springs, jumping into a swimming pool will perhaps be a little overwhelming. You might tense up, you might be afraid that you won’t make it. Instead you can ease in, starting at the shallow end and getting a little deeper every time. The best preparation for practicing yin poses is to practice yin poses. Physically, yin has other benefits beyond finding balance. Increased flexibility is one. 30% of what we call muscle is actually made up of fascia. Fascia is one of the connective tissues that helps hold the body together and is targeted in yin yoga. Other connective tissues that are stressed in yin are ligaments and tendons. Wait, stress? Yes, stress. Ligaments and tendons do stretch, but only in very small amounts. Stress results in stretch, strength, length and change. Whether you are talking about body parts or life parts, stress brings change. Alignment principles in yang yoga keep our joints safe while we stress our muscles. Softer longer holds in yin practice keep our muscles safe while we gently stress the joints. To gently stress joints we support them. And that brings us to – Proptions! At QSY there is a huge variety of props to support your practice and your joints. With the support of props you can slide your yin practice from relatively active to relatively restorative. Yin poses are held for a longer period of time, so there is room to explore your proptions as well as giving you time to drop out of your musculature (relaxing the muscles) and into your connective tissues (via passive stress). The cork and wood blocks are really wonderful for holding up bolsters, and supporting your sacrum (the flat place at the end of the spine) in bridge pose. Foam blocks are great for supporting limbs that don’t quite reach the floor, for instance if your forearms don’t rest comfortably in a bolster supported cobbler’s pose. Straps can extend your reach, allowing you to soften the muscles in the arms when practicing reclined hand to big toe. Bolsters can be used to support nearly everything. From a comfortable seat, to a sweet place to rest your head, there’s not much a bolster can’t do. Blankets can support limbs, keep you warm or even create a little secret space to tuck your head into. Props are a big part of a yin practice, experiment with them and see what ways work best for your body. A yin practice is always made up of postures that are done on the floor. Most of those postures can be practiced in several variations, and all of them can be modified to suit different bodies. Many of the poses will be familiar to even beginner yogis, but the length of hold and the intention to gently stress connective tissue rather than muscles transforms the practice. Even the gentlest of poses can become quite challenging with an extended amount of time to explore them. Not all of the challenge is physical, often when the body slows down the mind ramps up. There can be a meditative quality to your yin practice if that is your intention. I like to think of there being three S’s to yin – soft, slow, supported. The support of props and the slow transitions create the softness required to fall in love with yin. For a more in depth look at yin, check out Bernie Clark’s The Complete Guide to Yin Yoga.